I know I just finished my Samen, it’s finally dry and I just need to clip the ends (which I like to weave in before blocking). It’s quite spectacular and the recipient (my mother) got to see it and she is very excited about it. I’m glad that I finished it and I got a bit of yardage for it. As for more finished object I finished the mystery I started in October and put away because I didn’t want to look at it. That would be Exploration Station, knit in some bold, bright colors. Citrus, Maple Leaf, Dahlia, and Norway Spruce were the choices I made when I didn’t know what the design would be like. Now knowing what it looks like I would have chosen a darker color set. But it’s done, more yardage earned, and it will be given away to one of two knitters I know. I did meet Mr West on Friday, who recognized me, not sure if that is a good thing or a bad thing. But I suppose that I will just have to leave myself wondering. Another almost finished object is my Ivar Cardigan, all of the pieces are finished, blocked, and just needing to be sewn together. After that the button band and I have to get some buttons for it. I was very surprised how quickly the yarn dries, t’s amazing actually, within 3-4 hours it was bone dry, but I do try to get a lot of the water out of it when I’m doing my full wet block. Soon I will have another completed object, maybe this one will come with me to a trip that I will be taking this summer, which might actually be needed. Oh and I did quickly cast on one more thing, something that I have wanted to make from this designer for a while but haven’t had the right yarn for. This time, when I saw that one of the samples was done in Edison Bulb I knew that I had to make it. I searched the stash to find a color that I could use with Edison Bulb and I pulled out the last skein of Thunderstorm in Merino Light that I have. I’m looking forward to making this and finally getting to use that bright color. I am pretty sure that it will burn some retinas, including my own, which I’m guessing why the designer/model is , wearing sunglasses. The pattern I’m referring to is called Convergent, the designer I have always like the geometric designs and clean lines, so I cast this one on right away. So far I’m not sure if I like the needle size that I’m using, it’s making a fabric that is a bit looser then I would normally make, however it’s the needle size the designer recommend, and all of my good US 5’s are in use. 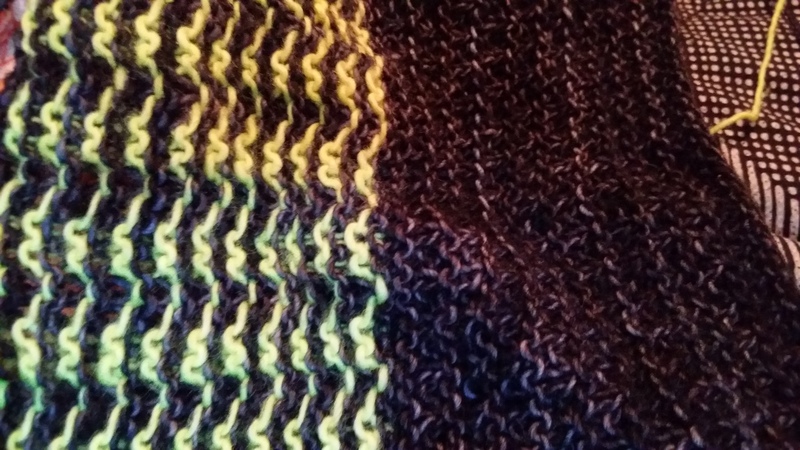 So far it’s an easy knit, nothing too complicated, just enough interesting bits that I’m not on full autopilot, but there are points when I can be on autopilot, which is nice. It’s going slower then I would like but that’s not the fault of the pattern, it’s just the amount of time I’m able to allocate to knitting it. Speaking of time, I gotta get back to the school work that I need to get done.